Phase 1 of the inventory is finished. Before I get to that I promised I’d leave a video of Heather with her goodies. I had so much trouble with my video camera Sunday so you won’t be seeing all that Maureen sent. Poor Heather, she was a bit uncomfortable with it all. How well I remember those days long ago myself. Wondering why total strangers were being nice to me and offering me things. That was so scary to me. I had nothing to offer them in return that was of any value and I felt so unworthy of the gifts I received. I was not quite sure how she felt about this whole thing until she came back yesterday excited with her creations. I knew then that all she was suffering was low self esteem and a low self worth. I’ll work on her with love – as has been done on me 😀 Love and kindness work better and faster than anything I can think of. I can testify to that very fact. This inventory thing has had me asking myself “What the Heck Were YOU Thinkin’ Girl!” But it is finished. Well, the first part of it is finished. 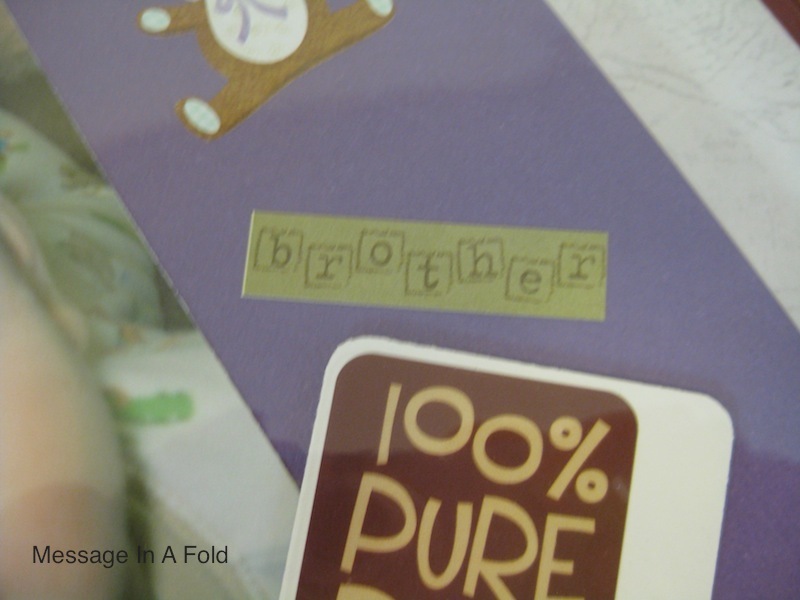 Having gone through all my dies and punches I did find three items that would look really good on a card. I received the big box of goodies from Maureen on Friday afternoon while Heather was at work. 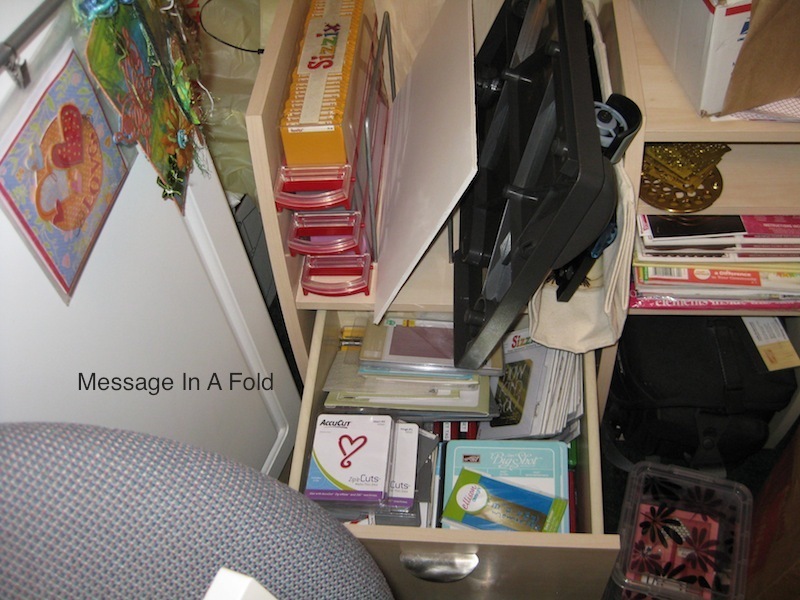 Heather also had to work on Saturday so she came by last night to see what had been sent to her. I have video of the box which will be downloaded to my iMovie thing later then edited. My camera’s battery died shortly after Heather opened the box and began digging through it but you can see the generosity of Maureen. Appropriately for the scrapbook lesson for Heather was the use of punches. She now has some of her own, thanks to Maureen. Also the next product I was intending on introducing Heather to was Rub-Ons and Maureen met that as well. Do you remember the first time you used a border punch? I do. Trying to make sure you get the piece of paper jammed in the punch base straight before you mashed on the handle and worked extra hard at not wiggling the paper and getting wonky cuts. 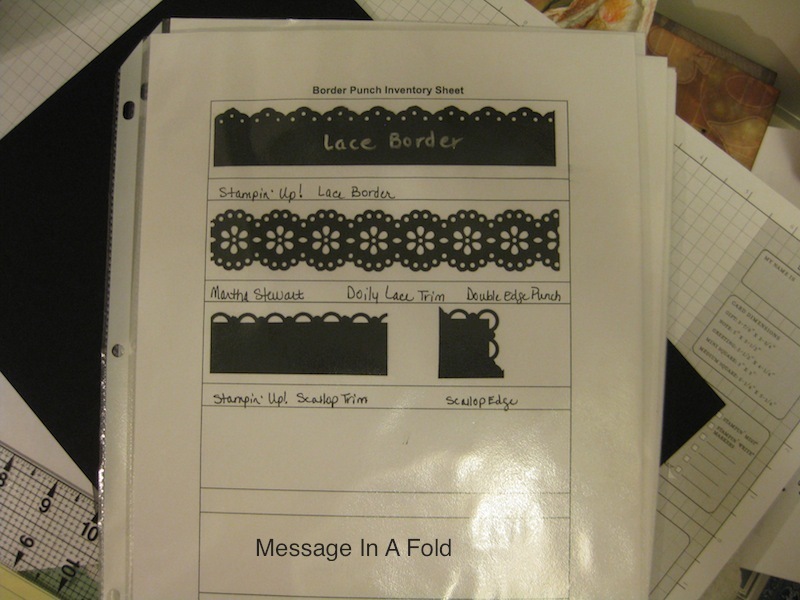 Then moving that strip of paper along the punch to get a good border. Man did I mess up several times. Over cut on some places and missed entirely in others leaving a gap between the punched areas. The Rub-Ons were a bit tricky to explain. How do you tell someone that the Popsicle stick is necessary without them laughing their heads off at you? Do you remember the first time you used Rub-Ons? I didn’t cut the pieces I wanted to use from the strip and had bits of adjoining images on my paper. I didn’t rub the vellum hard enough in places, for fear of tearing through, so when I lifted the vellum I found open spots on my paper with parts of the image left on the vellum. Have you tried to line that piece back up? Heather had mixed feelings about the stick and wanted to use her fingernails. I remember thinking the same thing. I just watched and encouraged as she worked away. I opted to not use photo mats on this layout because the photos were already taking up a lot of “real estate”. These boys are just so very cute. This project with Heather is my way of giving back. Reaching out to a soul going through a difficult time. Heather’s little boys are in foster care. No fault of Heather’s, just a really bad family situation that Heather wanted to get out of and the family had other ideas. She sees these precious little guys on Friday mornings. DHS is working hard at getting her reunited with her boys. While she goes through this bit of trouble I am making it a priority for her to remember this time as only a moment in her life. This is not forever. While she has the time with her boys she can make it special and have something to cling to while she is getting through this. Her assignment last week was to get down at her boy’s eye level to take photos of them. I think she did an excellent job. She is beginning to open up and be a bit more playful in this process. 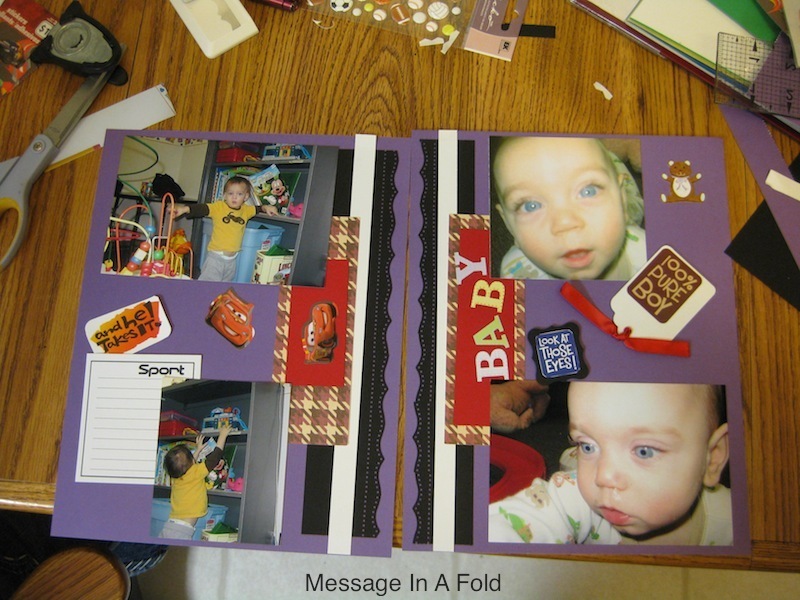 Learning about scrapbooking and the importance of having an outlet that is not totally dictated by someone else. I guide her, make suggestions, but she is free to make this book her own. She spent time going through the box from Maureen after she went home yesterday. She added bits of items to her recent pages. 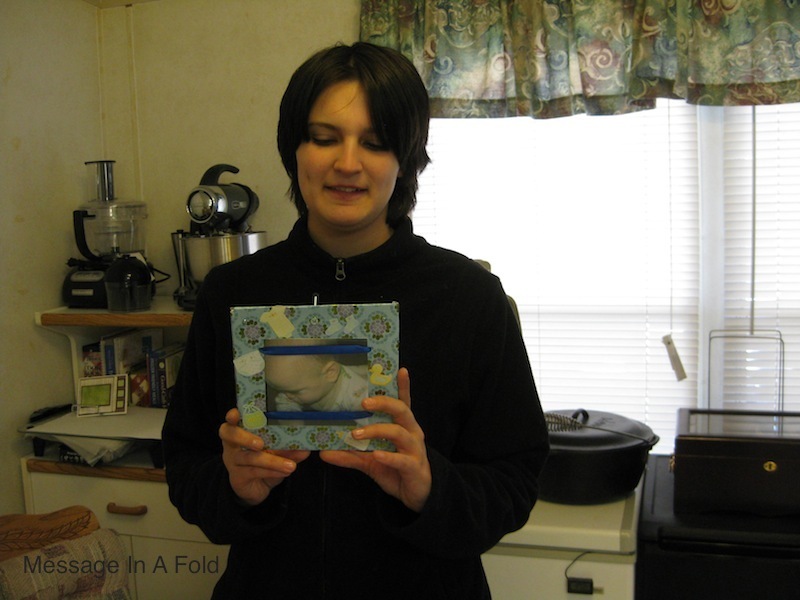 Heather was also pretty excited to show me how she used a frame thing she received from Maureen. There were three of them in the box and this is the first one she made. Am I proud of her or what?! Maureen. 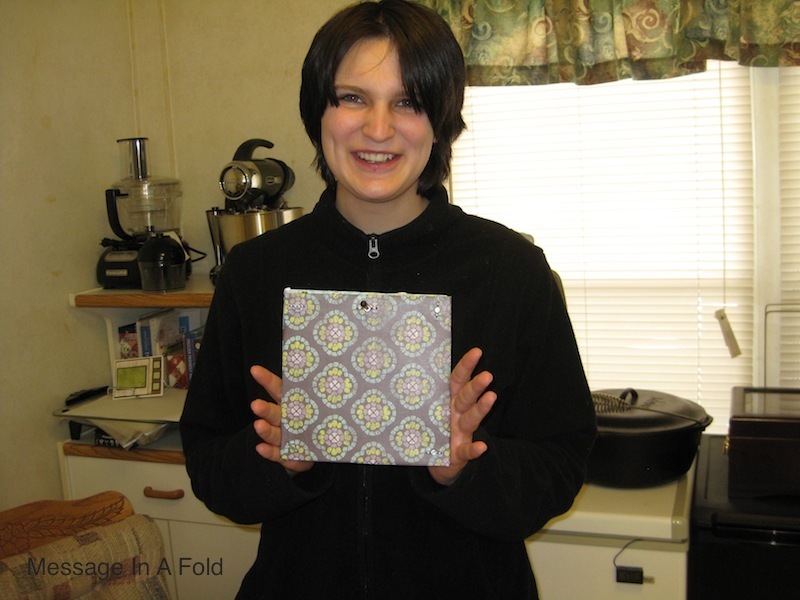 Your gift to this young lady has made a huge difference in her life. You being a stranger but my Friend, your generosity of giving from your stash has opened a world to her that we both get to be a part of. Thank you Maureen. 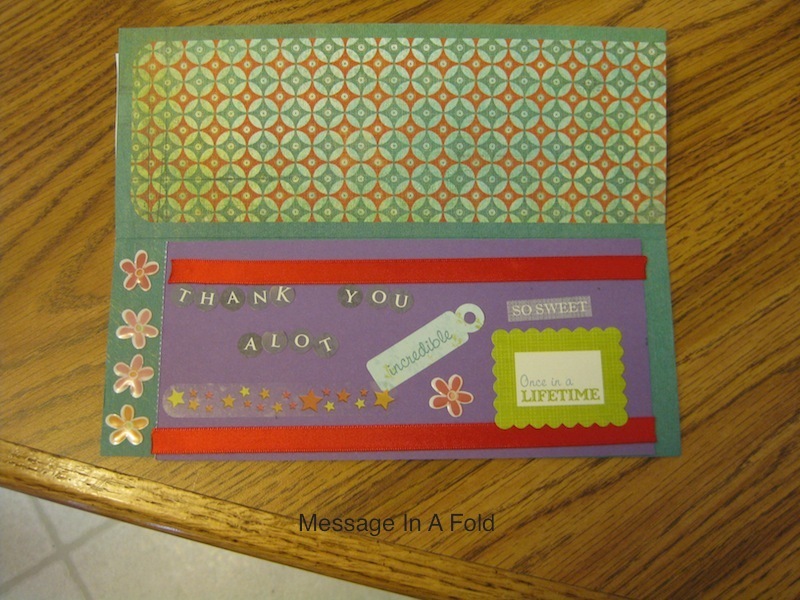 You will be receiving a card I made last year with a letter from Heather enclosed. You will also receive this card she made that comes from her heart. I know this will put a smile on your face. It sure as heck did mine! Yep. This says it all 😀 I could not say it any better. Okay, I’m bawling all over again. I’ll get the video up in the next couple days. 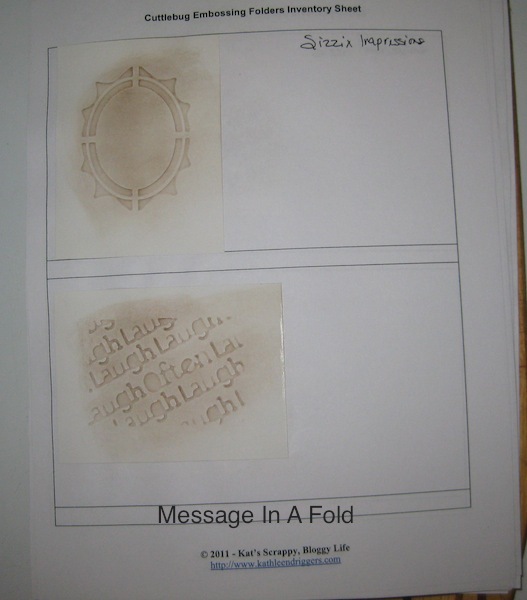 I have some tutorials on things I’ve found out about Spellbinders and the Big Shot, plus I want to make sure you get a glimpse of the gift from Maureen. Yes, Girlfriend. You want to kill me about now because I’ve mentioned your name numerous times in this post but I am blown away by your generosity and your loving spirit and heart – everyday not just today. I’m dizzy from going around in circles. My daily schedule has been getting up at 5:00 a.m. and start the coffee maker. While the coffee is brewing then I check my emails and blog post comments. Then by 8:00 a.m. do a bit of paperwork to catch up on things until 10:00 a.m. The remainder of the day is spent thinking about and doing craft things. Lately, I’ve had a bit of trouble getting away from the computer by 8:00 a.m. Lots, and lots of trouble. So much so that I’m really having a hard time getting myself on track. I have so many projects in the works now that I’ve really gummed up the works here. Picture frames from the Goodwill store. 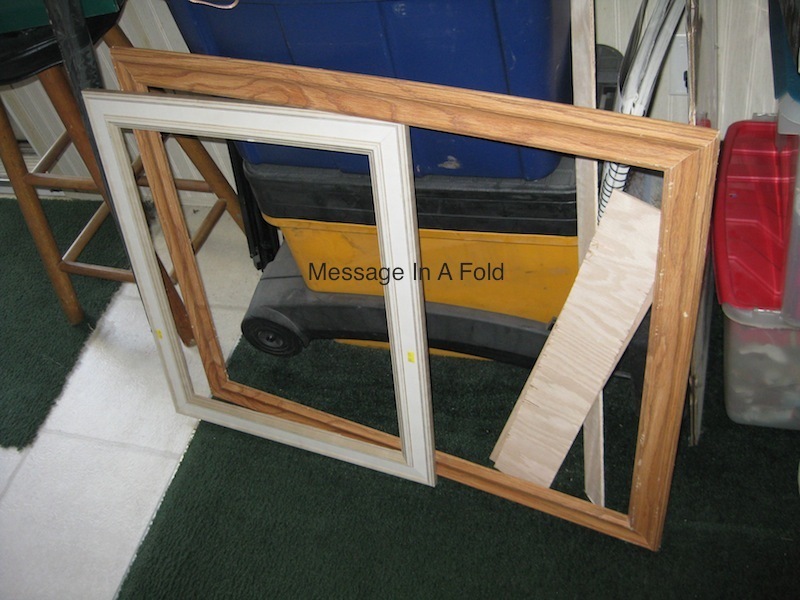 These two frames need to be sanded and painted. 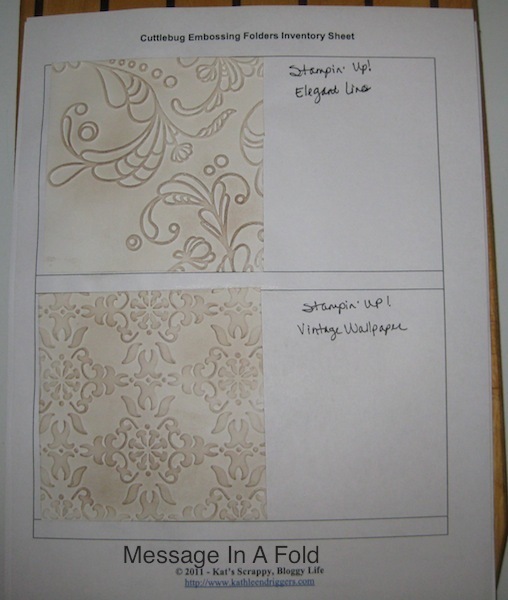 I haven’t chosen the papers yet for the bulletin boards that will be framed so I have not chosen a paint color. 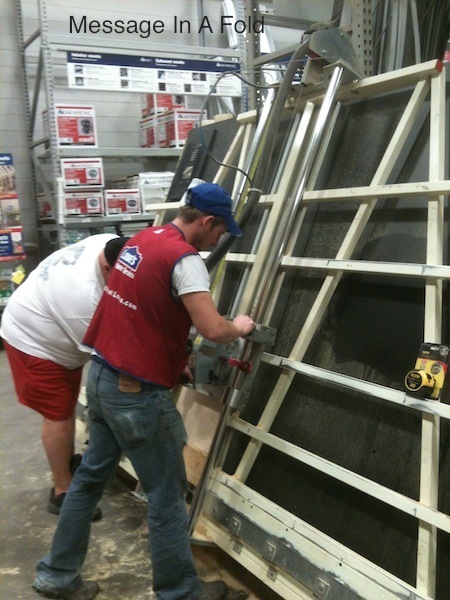 Remember this trip to the big box hardware store? The cut pieces of wood have now been turned into this. Man did we ever create a powerful stink in this house yesterday. Attaching this self healing rubber cork to the wood with Contact Cement. Man, Joe and I were both quite loopy by the time this part of the project was over. 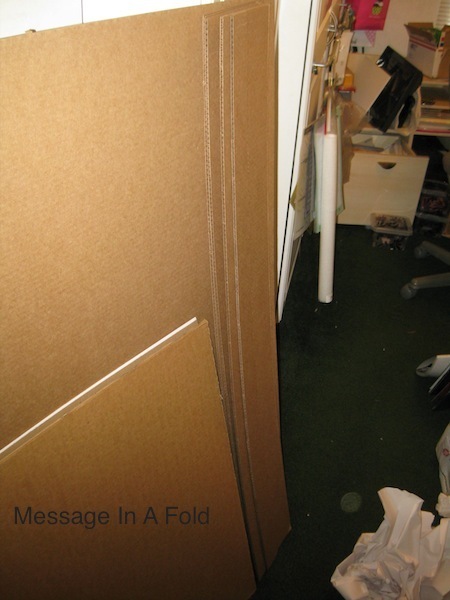 Yesterday I had Joe cut more cardboard for me. 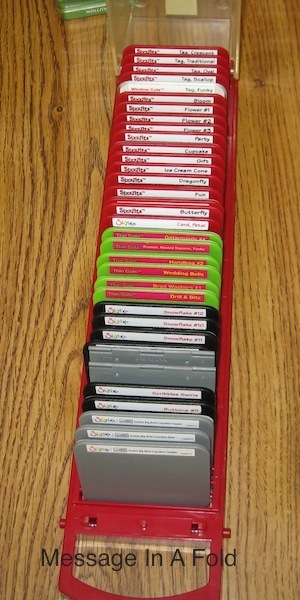 I’ve got an additional five Post-It holders to do. 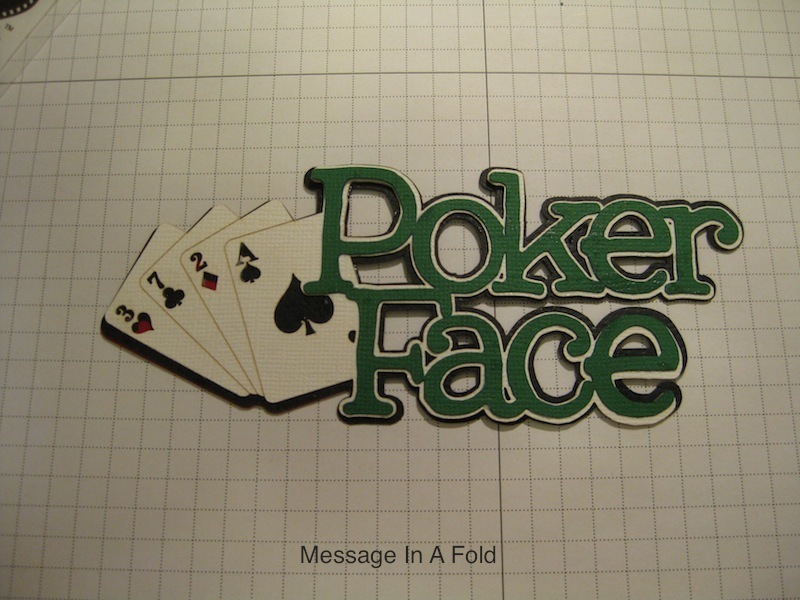 Revamp the Poker holders I made. I did spend a couple hours on the telephone with Tim to get the necessary information for what he wants done with the Poker holders. That was a much needed conversation. I’m still doing the “Inventory” thing with my dies. 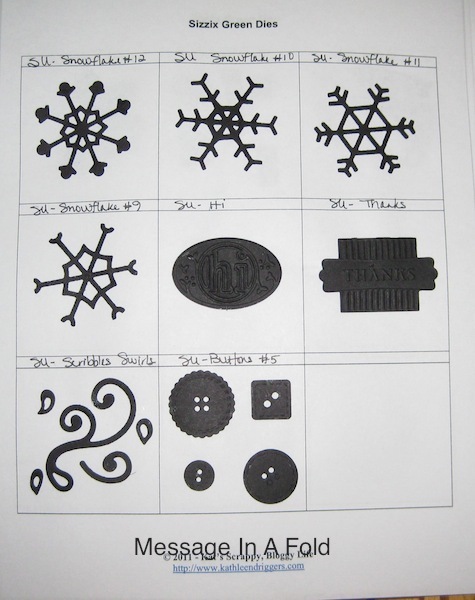 I have one set of Alpha Dies from Sizzix to complete then to begin on my Nestabilities/Shapabilities dies. Then all the die cutting and punching will be done. 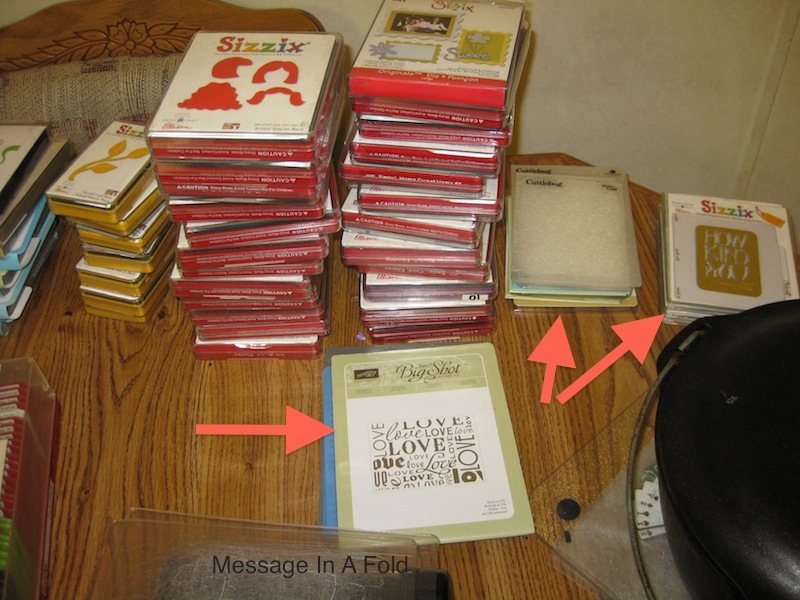 I have one of my Sizzix Alpha Die sets completed and attached to the Inventory Sheets. While cutting and mounting these alpha dies a thought occurred to me. 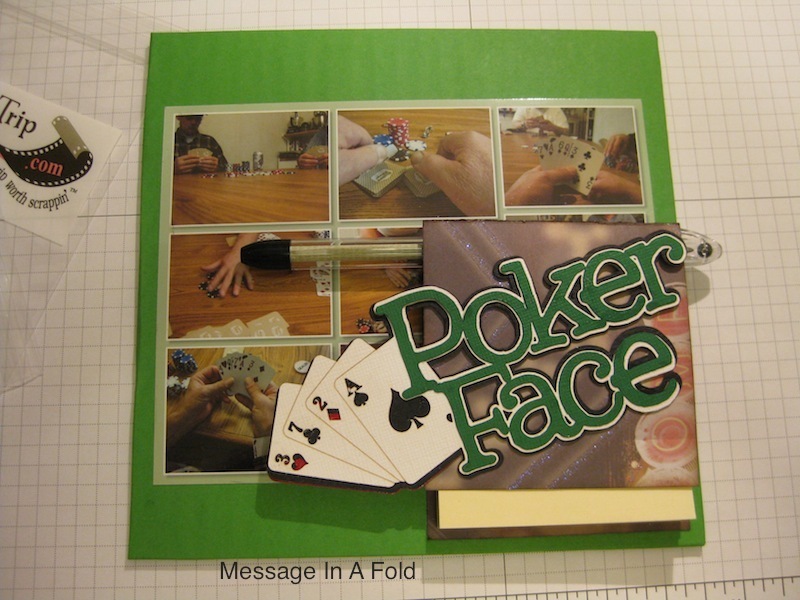 How about a “RANSOM NOTE” card challenge? 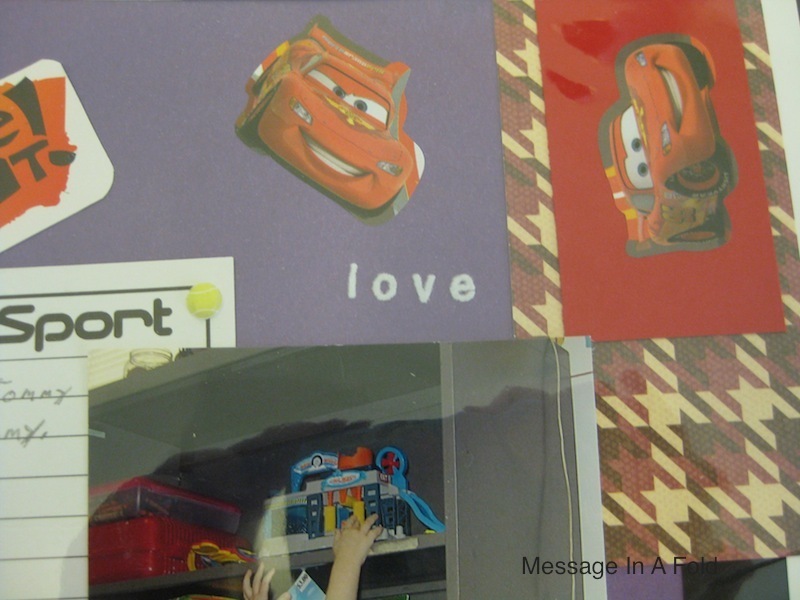 Use your letter stickers, alpha stamps, alpha dies, cut out words from magazines, tear out words from newspapers. Crumple up your papers and ink them up. Make them look like they have been around the world and back. Mess things up a bit. What would the card front or inside say? I’m still thinking on that and would sure enjoy some input from you guys. Joe loves to read. We have a Barnes & Noble close to our house that we hit about once a month. I’m thinking of getting him a gift card to purchase his next set of books. So my idea is while he is gone go to Barnes & Noble to get the gift card, talk to the manager and see if he/she would like to be in on a bit of fun. Word the card in such a manner as to say Joe MUST go to Barnes & Noble. He is not allowed to leave the store without finding three books. There are two people he has to encounter. Joe has to say to each person “The sky is blue” and they are to respond back to him with “The sun glows red” (or some such nonsense). The second person that responds to him will hand over the gift card tucked into a book that is laying on their desk area. Then Joe has to go to the center of the store and loudly say “Happy Valentine’s Day” before he can go to the checkout stand. Is anyone out there up for this CHALLENGE? 😀 You can do whatever is right for you and your spouse. Lynn, you can make Rod go out and find something you have made for him. Have him hunt around in your glorious flower beds. OMG, I crack myself up! Today will be my final day of doing my computer stuff in the morning. I’m going to get cracking on the work I have to do after my first cup of coffee. Then later in the evening I’ll check my emails and tend to my blogs. Attach your small punch items in the squares. Do you have Alpha Dies or Alpha Punches? Have you concocted your own “Brew” of spritz or mists? This would be an ideal form to document and display them. Each square is 1-3/8″ tall by 2″ wide. 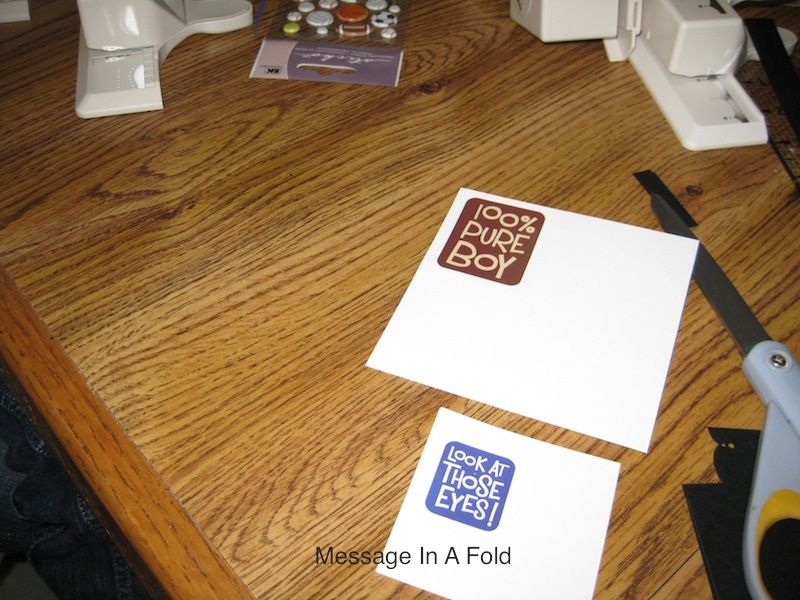 Your rubber stamp “Sentiment” images (most of them) will fit in the individual boxes. Have one sheet that is all “Happy Birthday”. Maureen has provided a space at the bottom of each square for your reference notes. Name of stamp set and manufacturer. Or the location the stamp set is stored. However you have them categorized. Maureen has even left a place at the top of the form for you to write what this page contains. Type it on a label or hand write it. 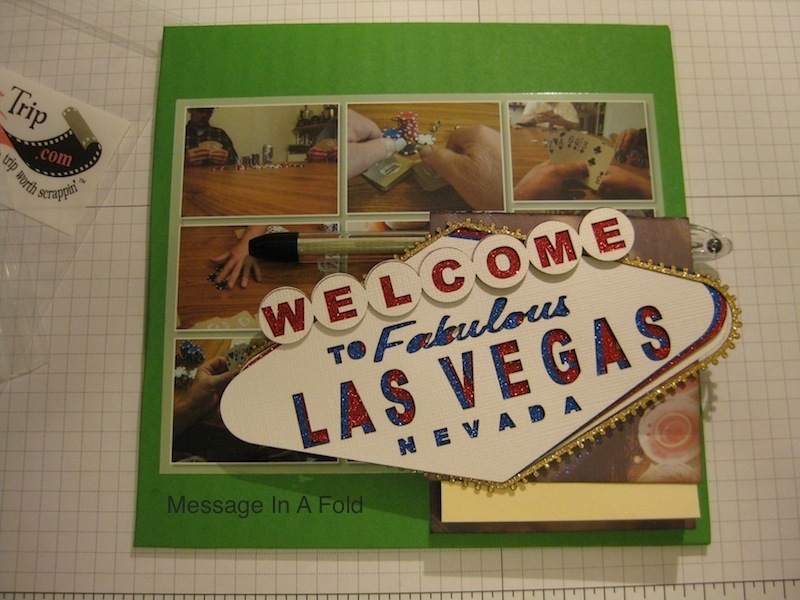 The deadline for the card challenge using an embossing folder, punches, and/or dies will be this coming Friday – February 3, 2012. Remember to upload your FABULOUS card to your blog or IP Address and leave a link to your awesomeness in my blog post of January 26th in the COMMENTS SECTION of that post. Thank you Maureen for the time you spent creating the Inventory Sheet for us and for reminding me to include a Deadline for the Card Challenge. I don’t know what you guys have in your tool stash. I have cheated. 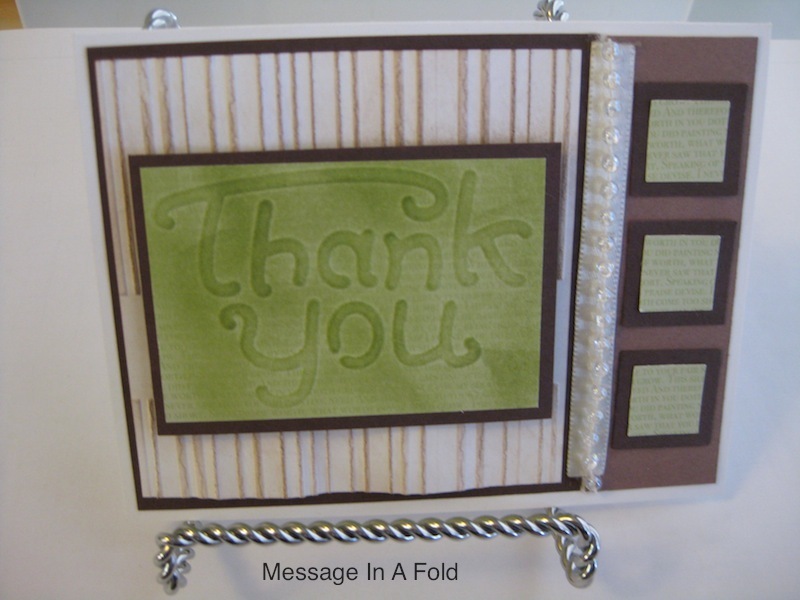 This card challenge is from Splitcoast Stampers from a long, long time ago. Joe got home at 3:00 a.m. yesterday morning and I stayed up waiting for him. Having risen at 5:00 a.m. Tuesday morning then staying up just 2 hours short of 24 this old broad was not in any kind of shape to do much of anything. Yesterday was a lost day. Use at least three paper colors. The largest will be for the #1 spot on the SC11 example. It is shown below these instructions. 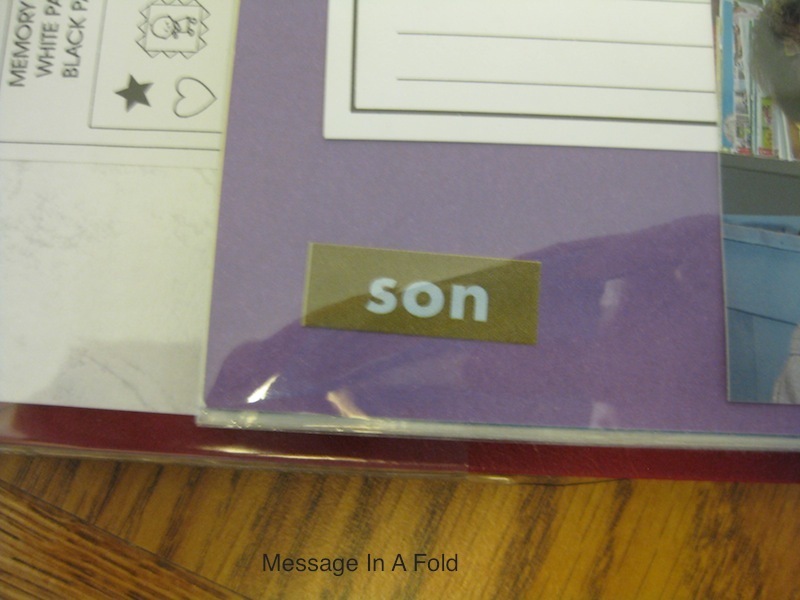 The sentiment area (“DAD” in example) you can use coordinating papers for mats if you choose. Use PUNCHES or DIES in the sentiment. 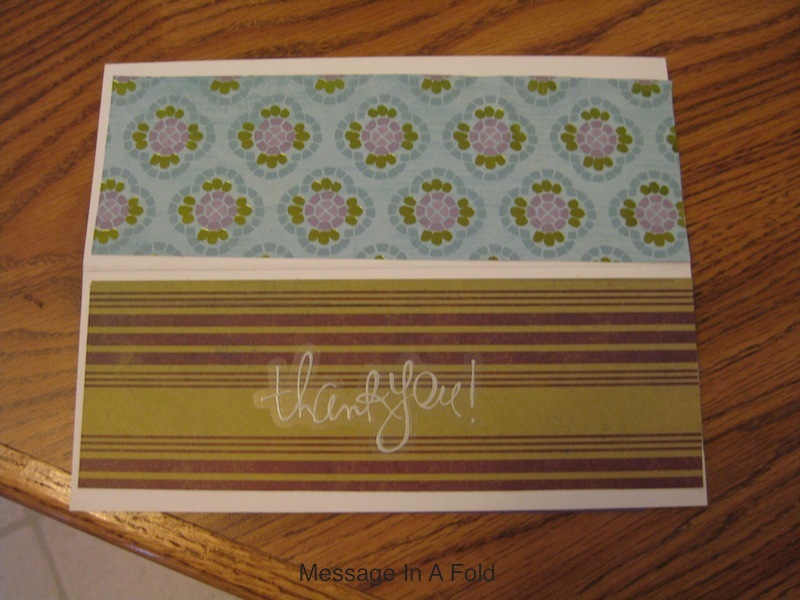 For example, a Stampin’ Up! Top Note die filled with lovely stuff 😀 along with your sentiment. Or a Scallop Oval punch with your sentiment inside. You know what you have. To the right of the card (noted as #2) use a coordinating piece of paper, either design or plain. 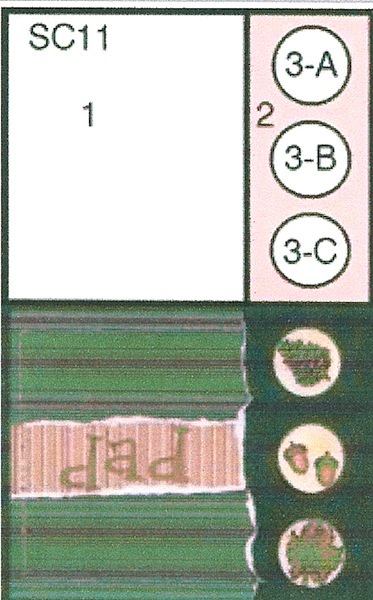 Use your PUNCHES to make the three embellished items (noted as #3-A, 3-B, and 3-C) on the right hand side. These don’t need to be circles. They can be whatever you want. Stamp images to go in the three punched areas on the right. 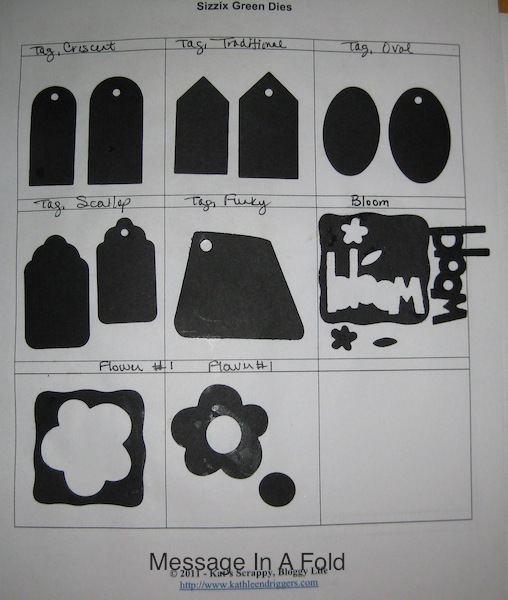 Flowers or other embellishments would be great in your punched pieces, too. You are free to use whatever product you wish. 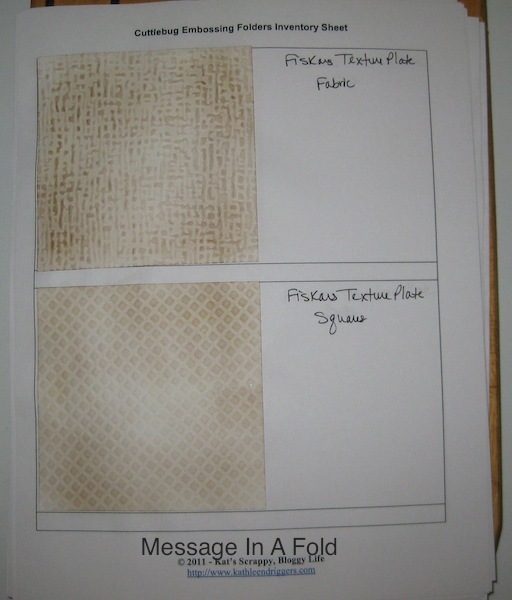 Heat emboss, distress inks, crackle glazes, whatever you want to use. After you’ve uploaded to your blog leave a link in the comments section of this post so we can all enjoy your beautiful creations :D. I will be posting my card creation here also. I’ll try to get it done on Saturday after I get Joe sorted with his trucks tomorrow. Dang, I can’t even follow my own directions 🙂 Okay, anyway here is the card I made this afternoon. I think I’ve included everything. Oh No! There’s no form for that! Yep, I encountered that yesterday. 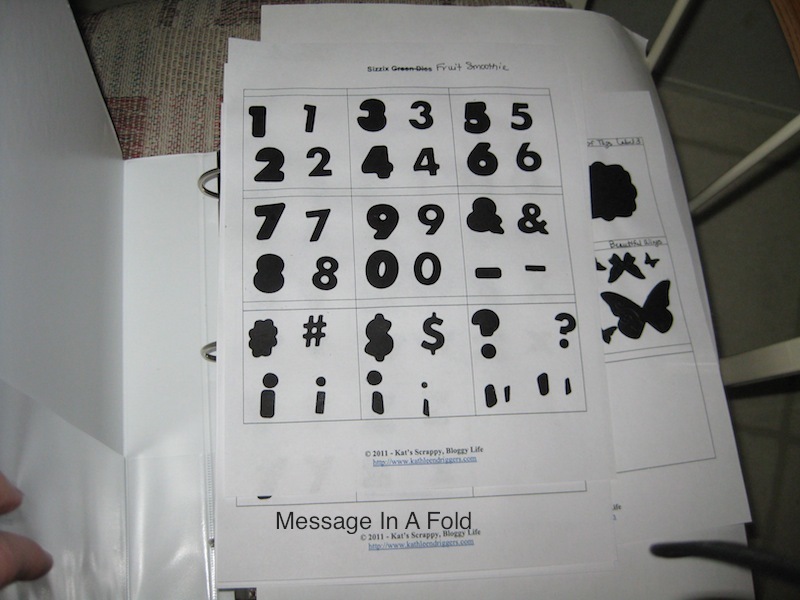 I had downloaded all of the forms from Kathleen Driggers blog. You can get them from her blog at the link (her name) I’ve provided here. I am “Windows Word Document Challenged”. I was able to make one form for myself and was pretty excited about that :D. Making a form with more than one column was a total challenge. So my hat is off to Kathleen for having the knowledge to make multi columned forms!! 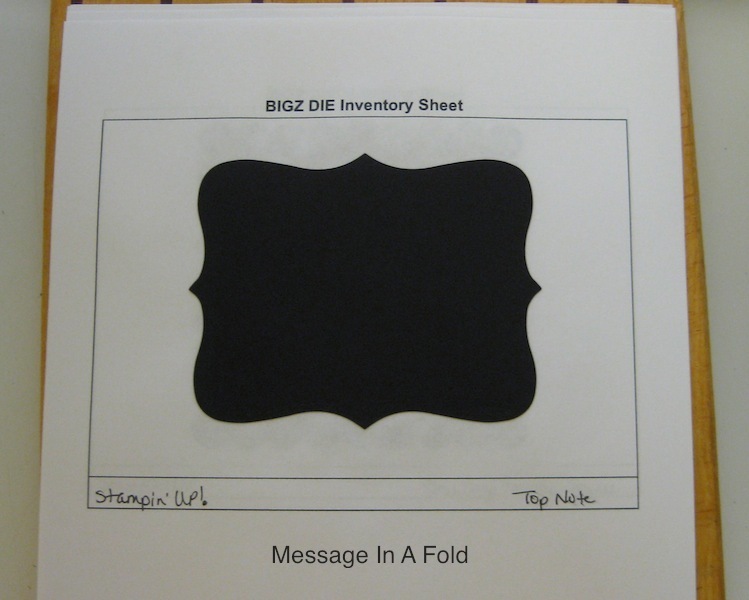 It is a form for the BIGZ Dies. 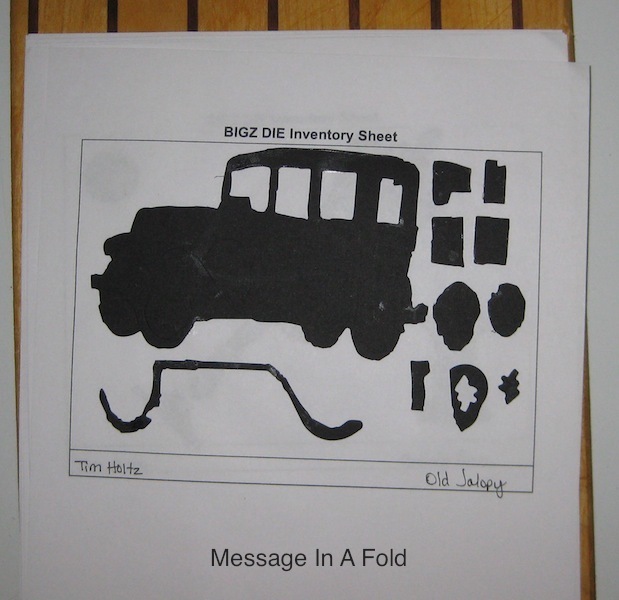 You can download it and use for your inventory books by clicking on the link for the BIGZ Dies. All I did was write in the name of who supplied the die (Tim Holtz, Stampin’ Up!, or Sizzix) then write the name of the die. This is most of my dies. I still have two trays of Alpha dies and several Nestability dies I will be doing today. 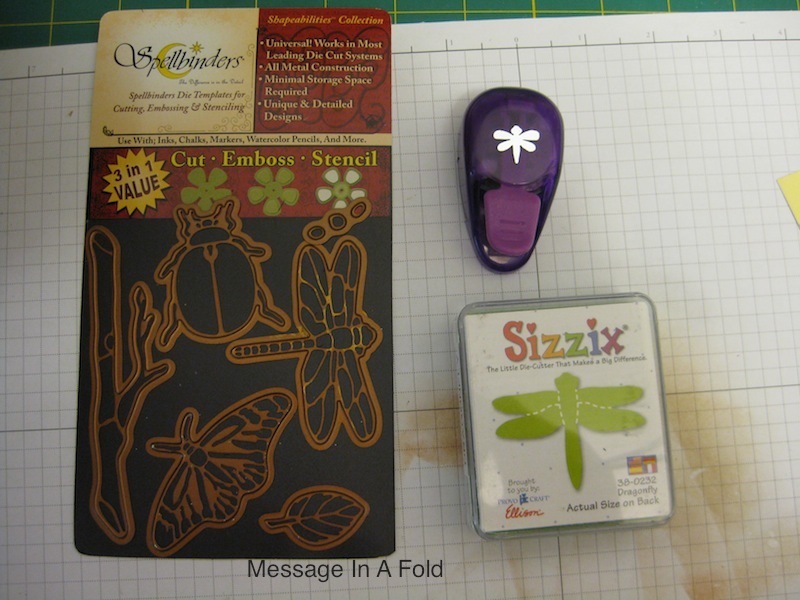 For my texture plates, embossing folders, and impression folders I used Kathleen’s “Cuttlebug” form. For my little dies, the Sizzlits, I used Kathleen’s “Green Die” form. Truly, I appreciate all the work Kathleen Driggers put into making these forms. 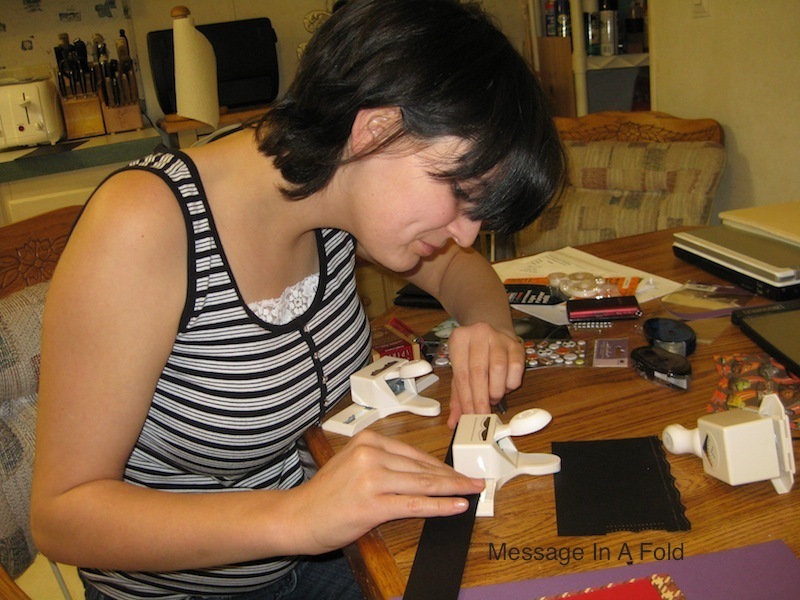 When she created them it was to catalog and inventory the items SHE has in her craft space. Each of us have different items in our stash of tools. If you are a “Windows Guru” then, by all means, create the forms that will work for you. If you are challenged, as I am, adapt to what you have available. Now I need to get the kitchen table cleared off. 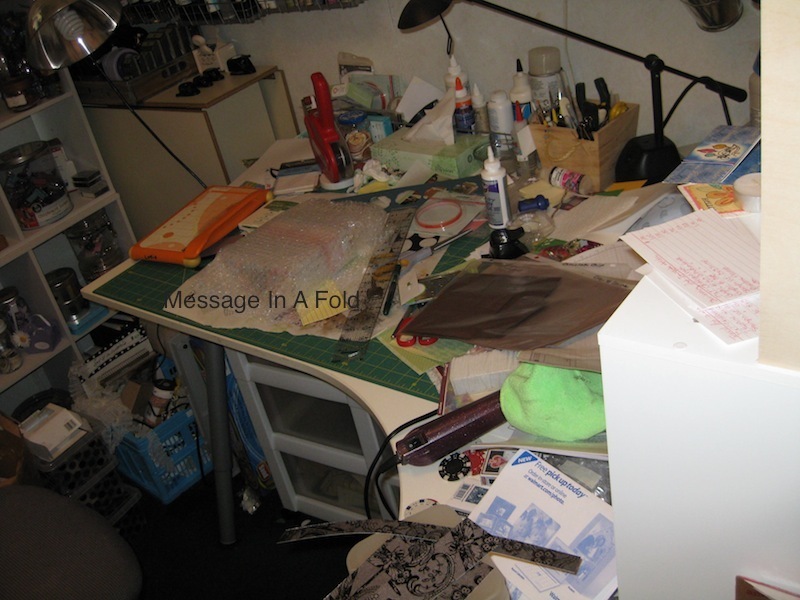 Not just because Joe came home in the wee hours of the morning and needs the table….I have more things to get die cut. AFTER I get Tim’s Post-Its figured out that is. 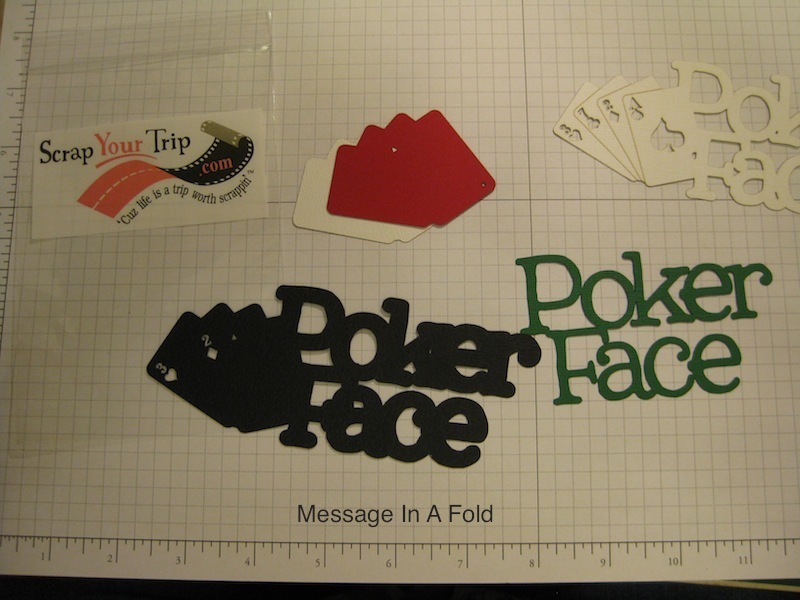 Scrap Your Trip Laser Die Cuts and a bit of inventory management. I ordered several of the laser die cuts on January 5th and they arrived Saturday. Seems they all took off for the holidays and when they got back one of their machines was not working. I did receive an email from them letting me know what was happening with my order. 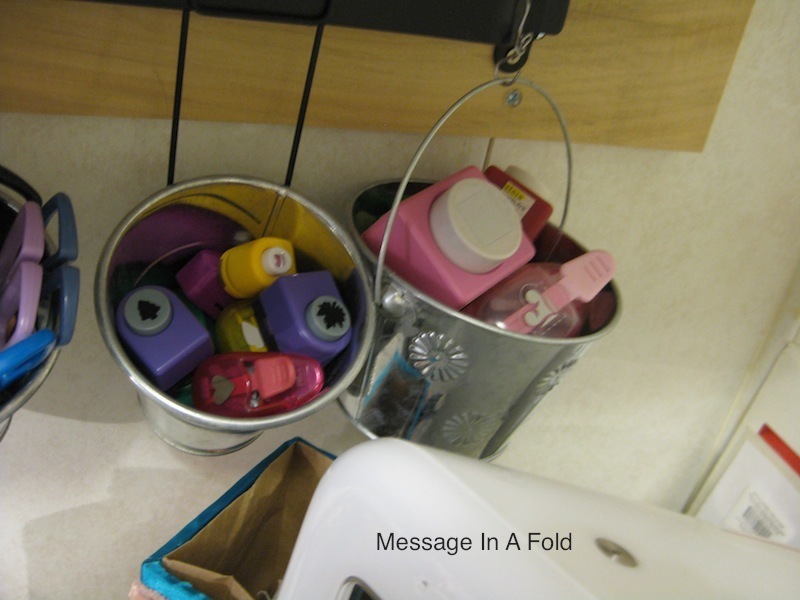 Scrap Your Trip is an online supply place I have used for quite a number of my Post-It-Note holders. They send me notification of items that are out of stock, and then I get notification of when my order is shipped. One little problem I’ve encountered is with the size of the items I ordered. There is not a size notation on the die cut items at their online store. 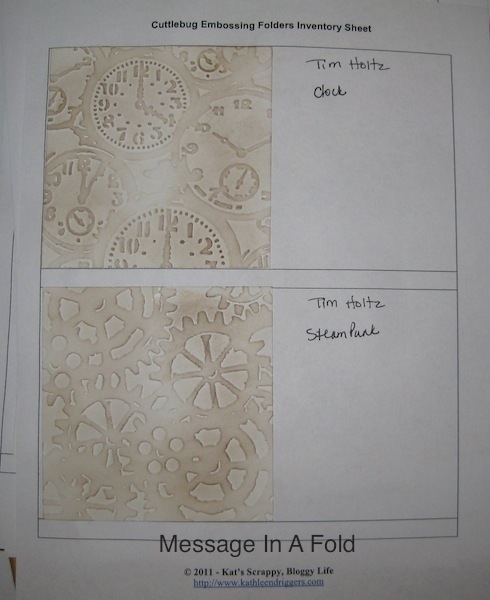 The laser die cuts are quite intricate and come in many pieces. “Assembly Required” which is not a big deal to me. The problem is I don’t know what the dimensions of the entire piece is. These die cuts would be excellent on a scrapbook page. Either 8-1/2 x 11 or a 12 x 12. These are not working well on my Post-It-Notes 😦 They are too big. 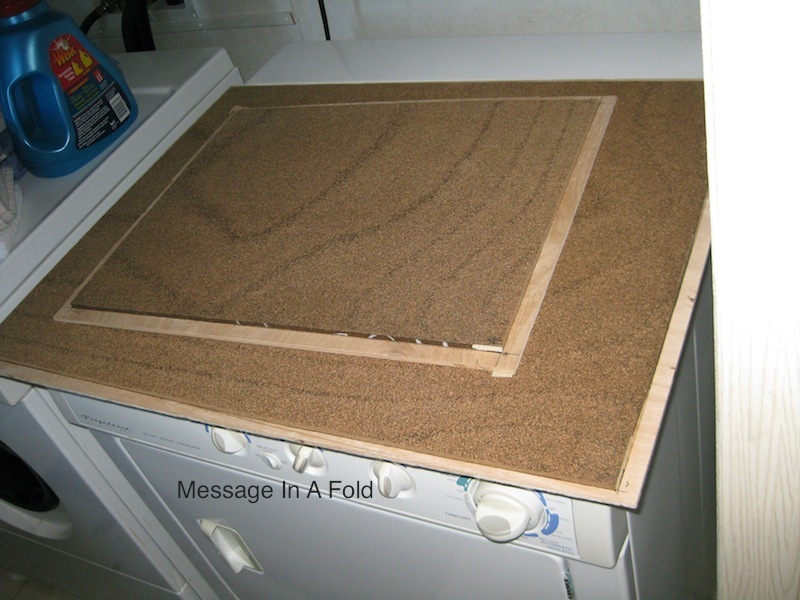 I can make this die cut work by adhering it to a bit of chipboard, or a piece of a cereal box. I think I will have to do that with all of them. Today I will be gluing and assembling these die cuts. Once they have been pressed and dried I will have to work out the backing for these. Can’t have them buckling and creasing before they get to their intended recipient. While these pieces are being pressed and drying I have given myself a challenge. I am beginning to get an Inventory Book together of all the STUFF I have. Have you seen the videos of the organized books people are making? This site has not been updated in quite a long time but the rubber stamp form is still there. It is titled “Stamps I Own” . If your printer software has a way of making a Print File into a PDF you can save this to your computer. That way you won’t need to hunt for this link online. It took me about three hours to find this puppy. 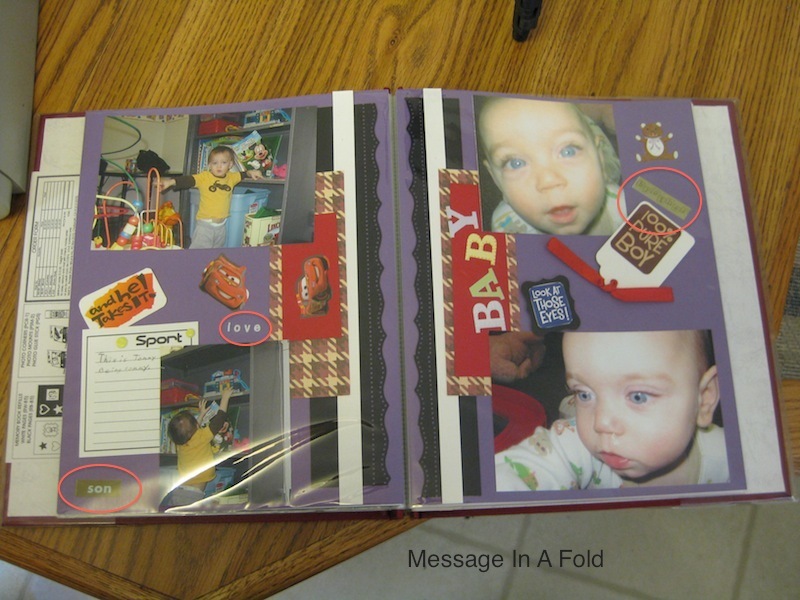 The full website link is Scrapbook Inventory Notebook. You might find some of the forms helpful to your organization. 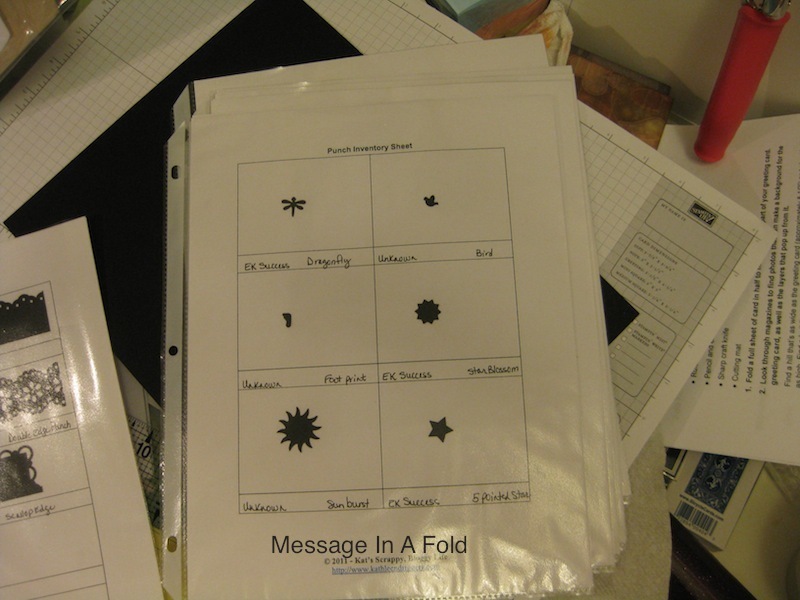 Another place I found has separate pages for our individual groups of supplies. All in neat little boxes to pigeon hole your items. This morning I have been going through all of my punches. I have itty bitty ones I forget about. 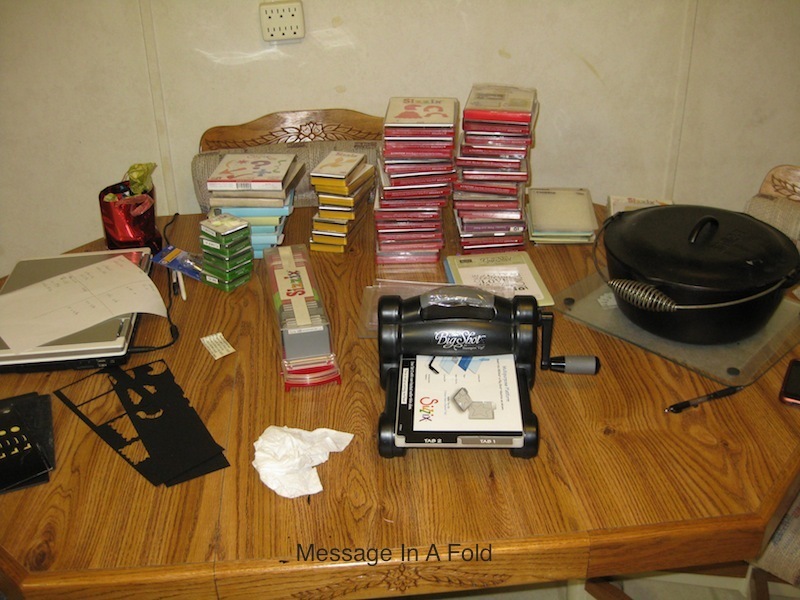 And I have quite a number of Stampin’ Up! punches along with an assortment of other companies….EK Success. Using Kathleen Driggers forms I have adhered my meager supply of Border Punches. I got through my other punches as well and adhered one to each square. If you are thinking about getting to know what you have in your stash these two websites I’ve referred to are good places to start. A word of caution. This is a HUGE time consuming endeavor. Punching out the images, gluing them to the spaces, then writing what they are and the manufacturer takes a bit of time. Wondering WHY anyone would be so crazy to set themselves this task? If you are planning on entering any of your creations to a craft magazine one of their requirements is to know ALL of the tools and supplies used to create your project. No matter if the tool or supply is no longer available on the market you will need to list all of the items you used. This is also useful if you are one to list all the tools and supplies on your blog post below your beautiful photo of the project. The added bonus of doing this is to get reacquainted with the tools you have put “Out of Sight, Out of Mind” for quite a while. I’ve also heard tell of people finding duplicates of items. As crafters we fall in love with one tool then put it away somewhere because we’ve gone on to something else. Then we need that once loved tool and can’t find where we stashed it so we go and purchase another one. Hence the duplicates. 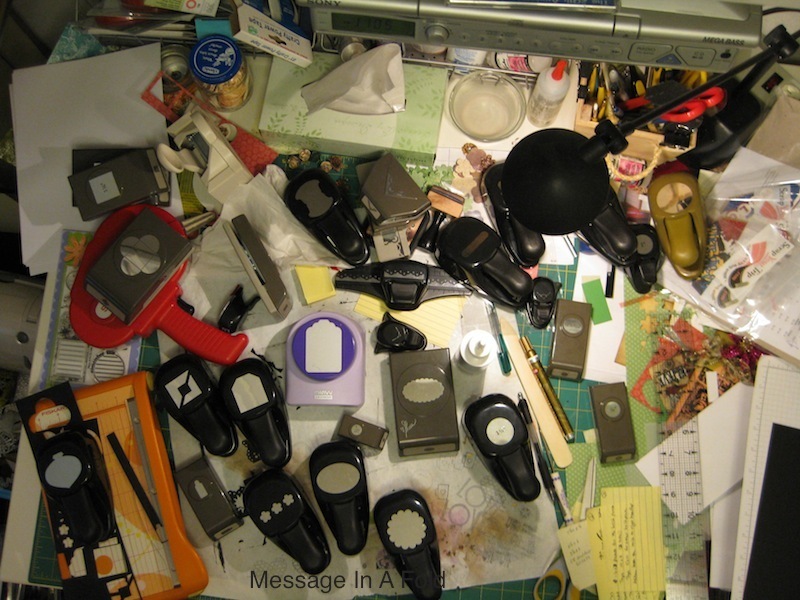 It is time for me to get back in my room and clean up that mess of punches! What will I do next? I think I’ll tackle my Sizzix dies next.